I only prepared snack bento this morning. Andrew got fever from last night so he is staying at home, absent from school. He had been saying that he didn't feel well and had a headache since dinner time last night. But I thought he was playing the trick for not finishing his dinner. Luckily last night we checked him in his bedroom and he really got fever. So he slept with me in my bedroom, I felt really bad last night ... I made some porridge for him this morning for breakfast before he ate his medicines. Hope he will have a quick recovery as Monday he will start his exam. Inside the snack bento was 2 little star shape egg-rice, star carrots+quail eggs. Seaweed rolls and tofu sandwich were from the fridge, put them in the boiled water for couples of minutes. Put zigzag zucchini, tiny orange, strawberries, and sweetened green cherries. And I would like to thanks RACHEL for giving me an award. I feel honored to receive another award for blogging. Rachel is a very talented mom and very loving mom. I love her passion for baking, cooking, and bentoing of course. She always involves her little princess in baking and cooking processes. It seems so much fun and bonding between her and her little princess. Her blog is one of my favorites to visit. 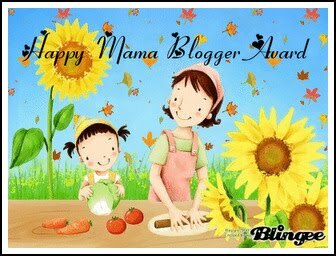 And I will pass this award to some wonderful blogging moms and please pass it to another moms also. Ooh, I hope your boy feels better soon... Your cute bento will surely pick up his spirits! Love it! Do you buy the rolls and tofu sandwich like that? Wish I were so talented to decorate those quail eggs like you do ! 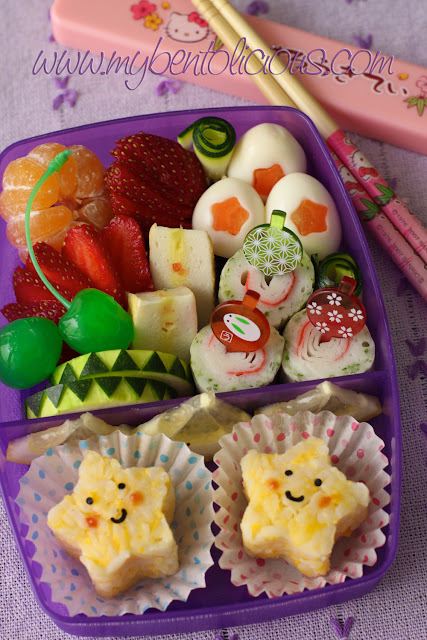 Just adorable bento!! Thank you also for this award, it's so nice of you to think of me for this! Oh, poor boy. I hope also he will get well soon! And I'm sure those stars will help him ^-^ I love the egg rice stars. They looks so cute. Thanks so much Lia!!! You are too kind. :) Your bento is so cute too! I love all of the pretty details and love you put into it. Hope your son feels better soon. Sorry to hear that you son is not feeling well. Thanks for sharing how you detailed the egg with star cutter. Clever idea. @tatabonita : Thanks a lot Ta! Ooohh .. I am sorry to hear Andrew is sick, hope he'll be better soon. Lia, you are welcome, you deserve it.. I love that star shape rice and the star shape carrot+quail egg(love everything in star shape..haha).. Wish your boy will get well soon, pity him..
@Rachel Hei : Thanks a lot Rachel :o) Andrew is getting better at least no more fever but he still has sore throat though. Though u oledi have it, pass this award to u again, to welcome u to the bentoing world, happy bentoing! Check it at my blog: http://kels-place.blogspot.com/2009/11/gifted-awards-again.html.